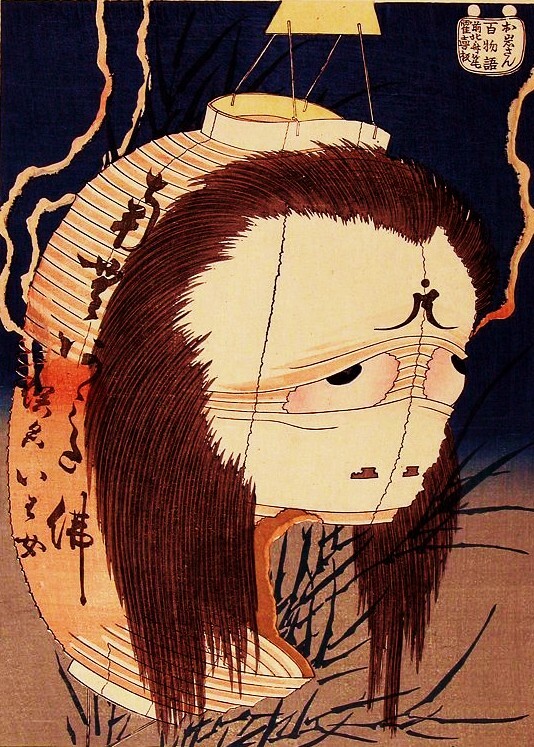 The gruesome death of Tanaka Kawachinosuke was told by author Tokugawa Musei, in story “Traveling Companions,” from his book “The Days of Tokyo.” According to Musui, the story originated in a game of Hyakumonogatari Kaidankai played in the Mukoujima Hyaken garden. My father, however, never missed a chance to dispute this. And to be honest, I don’t really know which one was telling the truth, Musui or my father. The very nature of these kinds of stories compels the storyteller to bend the facts, to make the story seem like they are speaking from personal experience. And to fiercely defend their version of the story to be true. Of course, a stranger’s version would be entirely different. Now my father claimed that the story of Tanaka Kawachinosuke did not come from a game at the Mukoujima Hyaken garden, but from his own storytelling circle at the Shogakan Gahakudo building, which stood opposite the bridge in Kyobashi. Shogakan Gahakudo was a legendary gathering place for Hyakumonogatari Kaidankai. At the entrance there was a permanently burning lantern hanging, of the sort normally only used for the Obon festival of the dead. You didn’t even need to plan the event, for such was the passion for the game that on any given night you could be assured a spontaneous round of storytelling would begin, with members alternating turns, exchanging their favorite kaidan. “The author Musei certainly never showed his face at the Shogakan Gahakudo! But this story I heard directly with my own ears, and the storyteller I saw with my own eyes, until he died. This detail alone casts doubt on Musei’s claim of the Mukoujima gatherings! The opening years of the Taisho era were an easy-going time. Japan had yet to be ravaged by the Spanish flu, and the Great Kanto Earthquake was still years away. Things were booming. The storytellers gathered as usual on the third floor of the Gahakudo to entertain each other with kaidan. On that day, an unfamiliar face appeared amongst the group. As was the custom at the Gahakudo, any stranger was compelled to tell a story. And what story did he tell, you may ask? Why, the story of Tanaka Kawachinosuke. We all listened intently to the tale. The stranger began by saying that this was the true story of Tanaka Kawachinosuke, and what happened to him following the notorious “Event at the Terata Inn.” The tale, he said, was one of ill omen, and carried a curse that would fall on anyone who told it. As a result, the true story of those events has never been told. Of course, as everyone knows this is the same Tanaka Kawachinosuke written about in the Yamamoto Yuzo play “Kindred Spirits.” The events took place during the time of the Tenshu army, when Fujiwara Yoshiko, daughter of the Chief Counselor of State Nakayama Tadayasu and little sister of Captain Nakayama Tadamitsu, gave birth to Emperor Meiji. Tanaka Kawachinosuke read stories of filial piety to the baby emperor, although he was far too young to understand them. But when he came to power, the Emperor remember Kawachinosuke fondly, and asked those of his inner circle what had become of him. An enquiry was made, and Kuroda Kyotoka intimated to Okubo Toshimichi: “Okubo, you know something of this don’t you?” Okubo answered this question with great reluctance. For there was a rumor going around that Tanaka Kawachinosuke had come to a violent end on the orders of Okubo. Because this man was talking about the death of Tanaka Kawachinosuke we all sat perched on our knees and with ears at attention. He said again, finishing his preface. From there he would begin again, going a little bit forward but always returning to “Of the people who know Kawachinosuke’s fate…” It was like he had no true subject. In the middle of this ramble, one person sitting and one person standing became two people standing. I wouldn’t go so far as to say they were trying to escape the stranger’s pointless story, but they found themselves called away bit by bit. For example, my father suddenly had a phone call from home. My father went downstairs for the phone call, and then had a cigarette at the counter. While smoking, when another person followed him down saying “He is on the Westernization of Japan again” and they both broke out in laughter. While the two men were sharing a laugh at the bizarre turn of events, another man came walking down the staircase. When he reached the main room, suddenly, and with no one immediately near him, the man fell face-down onto a small desk in the middle of the room. And he died. Of course, it was that same man who had moments ago been upstairs relating the story of the last days of Kawachinosuke. Author Kimura Shun wrote in detail about the early life of Tanaka Kawachinosuke in his book “Emperor Meiji” (Japanese History New Book, Published in the 31st year of Showa). When Keiko was pregnant, it was said Kawachinosuke would go daily to the Osaka Ikasuri Shrine to write compositions praying to the gods for a male child. However, because Kawachinosuke is not the focus of the book, his final fate is not touched upon.